Donald Cerrone marked his move to Welterweight with a stunning submission victory over fellow "Cowboy" Alex Oliveira in the main event of UFC Fight Night in Pittsburgh. Locking in a marvellous triangle choke in the very first round, Cerrone set his sights on anyone at Lightweight and Welterweight - and his performance gives him a warrant to do so. James Krause got the main card proceedings under way with a unanimous decision victory over Shane Campbell, although it could have ended a lot sooner than the judges scorecards. With seconds left on the clock in round 1, Krause locked in a tight rear-naked choke, but his opponent just managed to survive. While there were many ooccasions in which both were well matched, Krause put an exclamation mark on his performance with big punches to end the final round, winning 29-28 on all three judges scorecards. While the opener went the distance, the fight which followed would be over in 26 seconds as Chris Camozzi's barrage of vicious knees dispatched Joe Riggs in a Middleweight bout, stunning his opponent with a jab then unleashing the strikes until Riggs crumbled to the canvas; while also breaking his arm as he attempted to block the knees. Over in the Featherweight division, ground fighting proved to be the difference as Denis Bermudez prevailed on points over Tatsuya Kawajiri, having to adapt his gameplan from initially striking to defending the takedowns and controlling the fight for a majority of the action. Cody Garbrandt then continued his rise as he blitzed Augusto Mendes in the first round with less than a minute on the clock remaining. In front of his friends and family, the Bantamweight awaited his opportunity to find a flurry, eventually landing on the button with a clean right hand and eventually the referee called a stop to it. In the co-main event of the evening, Derek Brunson needed just half of a round to get rid of Roan Carneiro, with his vicious punching power flooring his opponent en route to another huge win. Taking advantage of Carneiro losing his balance, Brunson kneeled into the guard and landed plenty of ground and pound before the referee stopped it. And finally, it was time for two Cowboys to duke it out in Pittsburgh - both men showed excellent mutual respect to one another but when the gloves were touched they let it all go. Oliveira initiated the clinch early and scored with some knees, while a spinning effort went just wide. But the fight would change when Cerrone surprised his opponent by shooting for a takedown. Oliviera was vulnerable in half-guard allowing Cerrone to step over and find a triangle, and when they rolled, it was locked in tight, with the Brazilian tapping out as the other Cowboy marked his Welterweight debut in style. 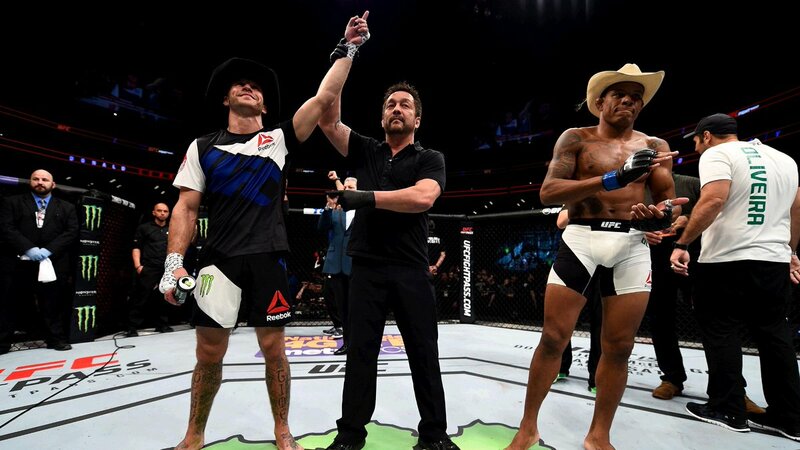 UFC Pittsburgh 2016: Donald Cerrone submits Alex Oliveira.